A full event itinerary will be published in July 2016. In the meantime, this page is intended to provide outline details which will allow participants to make plans and travel and accommodation bookings. The Event RTN is a two day cycling challenge in the North/North East of Scotland. This year’s RTN will set off for Inverness from The Square in Rhynie, Aberdeenshire on Saturday 27th August. On Sunday 28th the event will run from Inverness to Rhynie along a different route. The overall distance (over two days) will be approximately 175 miles, with a few hills along the way. The proposed route for each of the two days can be found on the event website. The potential for late tweaks caused by road issues means we wait until 10-14 days before the event before we send out the final route details and digital files. Early Registration, 26 August We will operate registration desks in Aberdeen (am) & Rhynie (pm) on Friday 26 August. PLEASE NOTE – there will be no bike transfer this year. RTN Eve, Rhynie, 26 August We will be working with the local community to host a welcome event for those who wish to travel to Rhynie on Friday night (details to be confirmed at a later date). There will be the option to camp in the village with space for tents and also caravans/campervans. 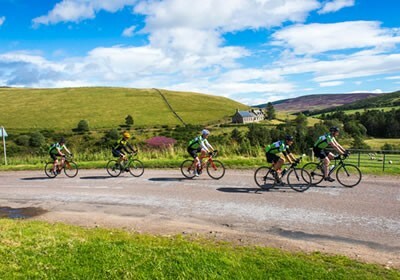 If you are interested in these options then please email neil@velodays.com to let us know.If you are travelling from outside the local area and don’t wish to camp at Rhynie, you might be able to find rooms in Huntly (9 miles) http://www.huntly.net/visitors/accommodation/ or at Kildrummy (8 miles), Alford (12 miles), Inverurie (20 miles) while the city of Aberdeen is 36 miles away (just under an hour driving time). RTN Day 1: Rhynie-Inverness, 27 August There will be free parking available in Rhynie from Friday to Sunday. There will be two car parks which are both 2 mins walk from the start line. You will be required to arrive in Rhynie a minimum of 40 minutes ahead of your allocated start time – which will be released nearer the time. Your start time will depend upon the start wave you have selected (roughly 0745-0815 hrs for blue wave, 0815-0900 green, 0900-0945 yellow, 0945-1015 orange, 1015-1035 red). This will allow registration, luggage check- in and a safety briefing by the support team. The destination in Inverness will be Culloden Academy which is 4 miles from the city centre. Bikes will be stored securely at the school. After reclaiming luggage you will able to leave for your overnight accommodation. There will be shuttle buses (every 15 minutes) from Culloden to Inverness city centre. The buses will drop off at a (central) single location in Inverness City Centre. Most local accommodation will be walking distance, but we will ensure a taxi-rank is nearby. If you require overnight accommodation in Inverness and haven’t yet booked, please do attend to this. It will be busy! RTN Day 2: Inverness-Rhynie, 28 August Day Two will resume from Culloden. Again there will be a shuttle bus service from Inverness city centre to Culloden. The central pick-up point will be the same as the set-down point the previous day. You are required to check in at the start at Culloden on day two a minimum of 30 minutes ahead of your departure time (which will be the same as the previous day). On arrival back in Rhynie the finish line will be at The Square. We look forward to welcoming spectators for the end of the ride and again there will be parking in Rhynie. Event Support The event is fully supported. You can count upon finding refreshments, lunches, water, mechanics, support riders, medics, marshals along the route. It’s fantastic that some riders may have friends or family who wish to support them, but we ask that these supporters make an effort to avoid driving on the route of event – we choose quiet roads to get away from the traffic! It can compromise the safety of participants if we have additional vehicles driving the route on event day.